Originally published in 1987, this popular book has been out of print for several years. 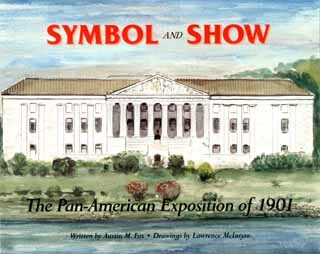 Symbol & Show: The Pan-American Exposition of 1901 was written by the late Austin M. Fox and illustrated by Lawrence McIntyre. The new edition is being released to commemorate the Pan-Am's centennial. Symbol & Show offers a riveting look at perhaps the greatest event in Buffalo's history. The 128-page book gives readers a lively assessment of the Exposition, bringing to light many half-forgotten facts. The major buildings are beautifully illustrated, as are many of the lesser-known structures. For example, various state buildings, the U.S. Territorial buildings and those of the Latin-American countries are included in all their nostalgic appeal. The book also offers a glimpse of the Pan-Am's bustling midway and features a copy of the original map pinpointing the locations of all attractions. The movers and shakers of the Pan-Am. The sports in the stadium. A financial appraisal of the Pan-Am.